I'm around 6'3" and I'm considering an ATA kit. I know the original suits where made for guys around 5'11''. Will the ATA kit work for a person of my height? Shoulder bells are a little small on me, I've also had to pull up my shins and drop my thighs a little to reduce the gap around my knees, there's also a bigger gap around the elbows and I have a small gap between the backplates. At 6'3" I'd say you'd end up with some bigger gaps, hopefully some other tall ATA wearers will chime in. 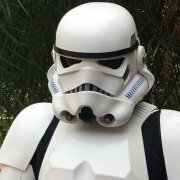 Great thread here with info for larger troopers so you can compare. Yes, it can definitely be modified to fit your body. I am 6 foot 3, 180 pounds, long legs and arms, long torso. Slim, standard build. I am 38 inches at the navel. Sounds about like me, 6’3” at 198 lbs. I fit in the standard Anovos kit with no shims, just adjusting the gaps and fit for me. I am 6’2” and 240lbs. I have an Anovos Kit, and made proper mods to fit in. While I’m not familiar with ATA, I’m sure similar methods can be used to make the armor work. I think you'd be okay with ATA, I don't know much personally, but I've heard good things. I do know for sure RT Mod and AM are good for taller and bigger troopers, so they are also options. Generally if you're within a few inches either way (more important when taller, rather than shorter, because you can shorten pieces, but lengthening is another story) of the original guys, then you're generally good.